To bring you up to speed. TTT are opening their new facility which will have the worlds largest and fastest 3D Metal or Additive Manufacturer (AM) printers. Deposition rate - Fastest deposition rates of up to 45 kg/hr. Can be faster with multiple robotic heads. Why the interest and +++ share price? Additive Manufacturing (AM) will change the way things are produced. Instead of casting, machining and assembling metal components, 3D/AM allows for the metal component to be printed. The reward is lower cost, fewer parts to assemble and no comparative loss of metal characteristics, and in some cases strength and durability increases. The flow on changes in terms of time, supply chain, prototyping new products are revolutionary. And replacing massive capital costs of machining/foundry with "printing in a box" solutions using metal powders. In terms of metal printing, the limitation generally has been that the laser-based 3D printers need to operate in a vacuum, and are limited in print size and deposition rates. TTT's process used cold spray kinetic fusion to deposit the metal onto a scaffold. The metal is never heated to a melting point, thus no need for the vacuum environment to prevent the metal from changing characteristics as heated. General Electric (GE) one of the worlds largest manufacturers has gone all in on 3D/AM. Press - As I sent to clients a week or so ago, the launch will have the official part on Wednesday, with a sprinkling of politicians I am told, and press. Thursday will be fund managers. Australians love to embrace technology when they are at the forefront of something or the first, and this is what TTT has. So I would be highly surprised if there is no coverage by the ABC at least, given the CSIRO connection. Jeff Lang is back in the workshop - Jeff was, until the appointment of the new CEO (Gilbert Michaca), the CEO/CTO from listing. I have met with Jeff perhaps half a dozen times now and he is the one who convinced me about the TTT technology. His background is in composites manufacturing where he has been very successful. And given they now have the facility, and are flooded with inbound enquiry (they signed MOU with Callaway golf last week and Italian shipbuilder Fincantieri Aust today), it is important the best technical people are working on the prototyping and trials under the MOU's. The reality is they could do with a dozen Jeff's, and we will discuss this on Thursday. Importantly this free's up the new CEO to focus on the international investor community and opening doors to new areas of collaboration. Other collaborations and MOU's - With limited time and machines to begin with they will selectively choose who to collaborate with. Things like aerospace will be very long lead times. Sporting goods, defence, shipping etc shorter, so expect a mixture of announcements. For TTT they can do both, high-value low volume, and low value high volume (remember they print a titanium bike frame in around 20 mins). I own TTT and made it my best pick for 2018 (HERE), so I am talking about a position I hold and believe in. To me, a technology that can transform manufacturing over coming decades is much more exciting than most of the new "tech" I am seeing. And if successful, I think the upside opportunity outweighs a lot of these tech ideas in terms of relative value (listen to this interview to get a better understanding of why I think this (GE's Chairman on Additive Matters). 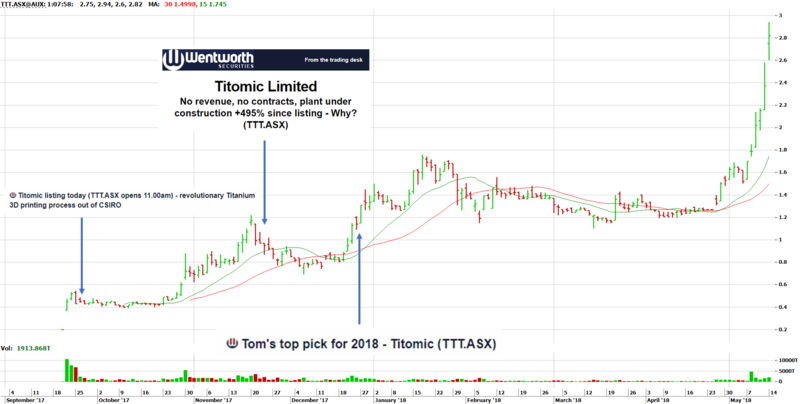 It's rare to find companies as transformative as the TTT tech has the potential to be, and perhaps now this is being reflected in the share price. It is not possible, in my view, to say if the share price offers good or poor value at this point, and would not pretend to know where the share price might be in the near future. And that is not the point of this note. My view, however, is there is meaningful value creation when the company turns out successful prototypes and explains from there what the revenue model/monetisation might look like for each customer (ie MOU's to Contracts). I will look to update investors post the site visit this week with further thoughts. Disclosure - The author of this desk note owns shares in TTT.ASX. The author is not paid to write this note. Important Note - This note is not a recommendation or advice to buy or sell TTT shares mentioned. TTT shares should be considered very speculative, high-risk, and very volatile. There are significant risks inherent in developing new technologies that are not discussed in this note. You should always seek professional advice before considering any share purchase or sale. Please read the disclaimer in full below. This is a desk trading note, and not a research document, and the view of the authors only.